Prometheus is a simple and beautiful, thought provoking, amazing film that expands the Alien universe beyond its Xenomorph constraints that tied the sequel’s hands. It explores the question of who and why we are here as much as providing entertainment and chills. In Space, no one can hear you scream. But why? How did the Aliens come into being? Ridley Scott (Gladiator) and 20th Century Fox try to answer these questions with the start of a new prequel series for the Alien saga and its first film, Prometheus. One's expectations determine how you feel after watching Prometheus. If you were looking for a true "Alien" film that features the infamous Xenomorph and looking for a straight lined horror/suspense film you will be sorely disappointed. These disappointed fans were actually vocal enough to change the direction of the film's sequel Alien: Convent which came out earlier this year and arrived the same date as Prometheus for the home market. However, if you went in without these expectations Prometheus is an amazing film, bringing Ridley Scott back home to his "Alien roots". Underneath all the action and crazy alien mayhem, he is trying to answer the age old story of life and death told in a very entraining way by one of the best directors of this time period. Scott is truly the master of the science fiction/horror genre that he helped to create. Under a different director, Prometheus might not have fared as well, however, coming from an artistic background Scott pays attention to every item that appears on-screen. Every little detail in the frame has meaning to the overall film and while the enclosed claustrophobic spaces of the original Alien film are not used as much in this iteration he still gives Prometheus an overall ominous feeling that makes one's skin crawl. While the Xenomorph's ancestors and their's creators, The Engineers, play a large role in the film, the crew interaction with each other is truly the heart and soul of this film. Rapace's character portrayal of Shaw is exceptional. Her drive to find out the meaning of life envelopes her entire character and drives all her motivation in the film. This drive and performance is seen as well in Marshall-Green's Charlie character. However, while hers is driven by caution, his is more on instinct that throws this caution to the wind. While Theron, Elba, and the rest of the cast are amazing in their own right, the performance that shines through the most in Prometheus and even continues on in Alien: Convent is that of the android David portrayed by Fassbender. While androids characters are no stranger to the Alien universe Fassbender's portrayal stands out as the best performance to date. It is truly eerie watching it at times. Fassbender constantly has the audiences guessing his motives and driving purpose throughout the film. At one minute he seems to be caring about the crew, while at the next he appears to be pursuing his own agenda. While his performance did not garner any awards the year of its release one can only hope he does for Alien: Convent. The disc is encoded in 2160p with a 2.40:1 aspect ratio. While the film was recorded digitally at a very high frame rate, the finished project was only done in a 2k resolution which leads a little bit to a soft picture when it is upgraded to the 2160 resolution. However, saying that, Prometheus has never looked better on a home theater system. Blacks are spot on, and the color palette is truly exceptional with the wide UHD color spectrum that gives an extra enhancement to the subtle color shading found throughout the presentation. Complementing the exceptional video of this release is a DTS-HD Master Audio 7.1 soundtrack ported over from the Blu-ray release of the film. While 20th Century Fox didn't take advantage of a Dolby Atoms or Dolby Vision soundtrack the audio still packs a powerful punch. The dialog is crisp and clear while the special effects take full advantage of the speaker system, having the special effects surround you proving an even creepier feel the film. The Prometheus combo pack does not contain any new special features created for this 4K UHD release. All of the features have been ported over from the original 3D Blu-ray release of the film including a 1080p digital copy of the film for iTunes and UV, audio commentary by Ridley Scott, John Spaihts, and Damon Lindelof, Deleted and Alternate Scenes, The Peter Weyland Files (promo videos used to virally spread the word about the film), a three hour making of featurette, and the Weyland Corp Archive which contains an miscellaneous collection of artwork, small featurettes, and trailers. While all these special features are over 4 years old they still hold up very nicely and are an interesting look into the world of Prometheus. Prometheus is a simple and beautiful, thought provoking, amazing film that expands the Alien universe beyond its Xenomorph constraints that tied the sequel's hands. It explores the question of who and why we are here as much as providing entertainment and chills. While a section of the movie going audience rebelled against this film since they went in with expectations of an "Alien film", the movie is great as a stand alone. 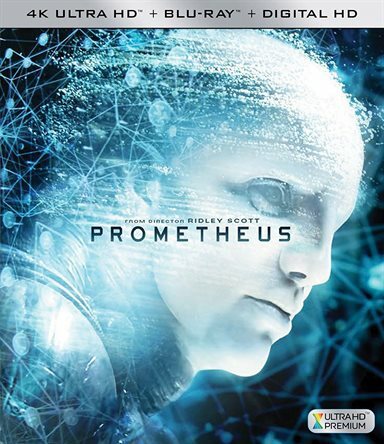 If you are a fan of this film there is no other version of this movie that comes close to giving you the ultimate experience of watching Prometheus than this new 4K UHD version. I personally applaud Ridley Scott and 20th Century Fox for giving us something familiar yet new in the ever expanding Alien universe. One can only hope they continue with more after this year's Alien: Convent.